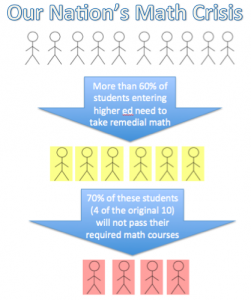 On average, in a 30 person classroom, at least 12 students will lose their opportunity to access higher education and a wide variety of career choices due to their inability to meet math standards. As a son and friend to numerous intelligent people who I have heard make this statement, it always surprised me – until I became a math teacher. For decades, state standards have pushed teachers to focus on rote learning by handing them too many concepts to cover in too limited an amount of time. Such policy led to a focus on formulas and neglect of application, not only making the material less relevant for students but also harder to grasp. In the classroom, it amazed me just how powerful it was to relate math to real life situations in order to make it practical and tangible for students. When I translated -10 + 15 to: “I owe you ten bucks but just made fifteen; how much do I have after I pay you back?” a student who had been struggling with positive and negative integers for years suddenly became a master. The reality is that numbers are everywhere and every single one of us interacts with them everyday whether we ensuring that we are dividing dinner checks up fairly with friends or verifying the validity of my info-graphic. The good news is that we are all math people, and just need to realize it. While that is tough to grasp for people who were told for years by a letter grade that they weren’t, some powerful players are stepping up to address this crisis. I was inspired to write this post by NovoEd’s recently released partnership with The Carnegie Foundation for the Advancement of Teaching. This organization has experienced amazing progress in improving remedial math outcomes in community colleges, in a large part by teaching math as it relates to daily life, and aims to expand its reach through our platform. We are hosting a short pilot course with Carnegie this October to help prepare for a full rollout next year which you can check out here.